I included Glaspell’s “A Jury of Her Peers” in our course for a few reasons. 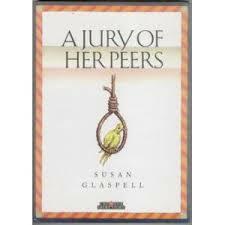 First, I really love hearing what students have to say about the ethical dilemma that Glaspell explores in her short story – what does Mrs. Hale and Mrs. Peters’ choice to conceal the dead canary say about the inadequacy of the law? Second, you may have noticed a theme connecting the past four short stories, that of women and confinement. (Jacqueline remarked in Discussion Board 5 last week how we are seeing many female protagonists experience a period of isolation.) Finally, I think Glaspell does an incredible job playing with different points of view, which characters are able to identify and read the clues of Minnie’s story. Glaspell drew on the murder trial of Margaret Hossack, which she reported on in 1901, for the inspiration of “A Jury of Her Peers.” In December of 1900, John Hossack was killed while asleep in his bed by two powerful blows to his head. His wife of 33 years, Margaret, claimed to have been asleep through the entire incident, only to wake as the murderer was leaving the house. She maintained her innocence; however, when the murder weapon, an axe, was found, she was arrested and charged with the crime. The trial quickly gained notoriety and is considered one of the most sensationalized court cases in Iowa’s history. People became fascinated with the case for a couple of reasons: first was Margaret’s alibi of having slept through her husband’s violent murder, and second was the stoic demeanor that she kept throughout the trial. 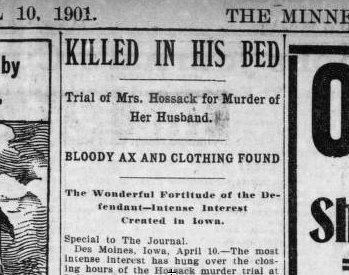 A notable aspect of Hossack’s trial was the question of spousal abuse. Hossack had told neighbors that she feared for her life. However, at her trial, it was the prosecution who presented the abuse that Margaret suffered at the hands of her husband, arguing this was evidence of her motive to kill him. Her attorney did not attempt to argue the abuse as a mitigating circumstance. At this point in US jurisprudence , there was not really a way of talking about domestic abuse, which was considered a private, not public matter. On April 19th, 1901, Margaret was found guilty. Yet the Iowa Supreme Court overturned the verdict and ordered a retrial, which resulted in a hung jury (9 for conviction, 3 for acquittal). A third trial was never held. 1) While Minnie is childless, Margaret had nine children. Glaspell may have made this change to emphasize the isolation that Minnie’s husband, John, keeps her in. 2) Rather than being bludgeoned with axe, Wright is strangled with a rope. 3) While Margaret’s motivation was brought out during trial, the evidence of Minnie’s motivation is concealed by Mrs. Peters and Mrs. Hale. The plot of “A Jury of Her Peers” is relatively simple: Mr. Hale, a local farmer and the one who discovers John Wright strangled in his bed, goes with Mr. Peters, the sheriff, and Mr. Henderson, the county attorney, to the Wrights’ house to gather evidence of motivation for Minnie Wright, nee Foster. Both Mrs. Hale and Mrs. Peters accompany the group of men to pick up some clothing for Minnie, who is currently in custody at the Peters’ house. While the men go about search the home, the women discover evidence that tells the story of abuse that Minnie suffered at the hands of her husband. Knowing the full story now and knowing Minnie may not be able to receive a fair trial, both women decide to conceal the key piece of evidence that would indicate Minnie’s motive for the crime. The story almost entirely is set in Minnie’s kitchen, a place that the sheriff quickly dismisses as insignificant. While gathering items to make Minnie feel more comfortable, both women are able to see the signs of abuse that Minnie endured and piece together the complete story. First, Mrs. Hale finds the sugar that is only half put away. Then she notices the poor quality of the stove, thinking “what would it mean , year after year, to have that stove to wrestle with” (675). The women’s attention turn next to Minnie’s quilt, which appears expertly done except for the last piece that “looks as if she didn’t know what she was about!”(676). Mrs. Peters begins to wonder what made Minnie so nervous at that point in her sewing. 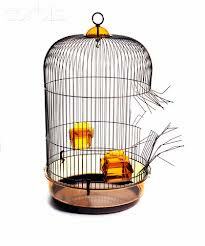 A huge piece of evidence in the form of the empty birdcage, whose door has been torn of its hinges, raising the question of what has become of the bird. What allows the women to see and understand the clues is their ability to empathize with Minnie. In this way, Glaspell presents them as being better suited to act as Minnie’s jury, from which they are excluded by the law. If the men, who represent the law, don’t know what to look for and are unable to appreciate what Minnie has gone through, then how can they possibly act as her judge? 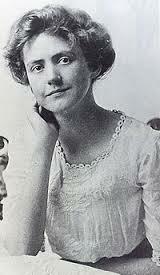 * Glaspell through her short story questions the value of the law as objective, rational, and unfeeling. Finally, I want to draw your attention to the remark that Henderson makes to Mrs. Peters, “For that matter, a sheriff’s wife is married to the law.” While this may seem at first as just an off-handed comment, Henderson’s remark reveals the gender inequality when it comes to the legal system. The law, as Henderson implies, is something that Mrs. Peters, as woman, does not get to participate in – her only legal identity is as the sheriff’s wife. This exclusion of women from the legal system sheds light on why the women chose to hide the dead canary from the men. The only way for Minnie to receive justice is for the women to act outside of the law. Note: Glaspell adapted her short story for the stage in a one-act`play, entitled Trifles. 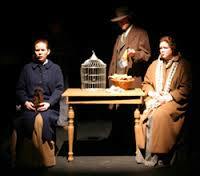 (You can find the play on pages 1383-1393 in your Norton Anthology) I found a youtube video of a production of the play. *Bendel-Simso, Mary M. “Twelve Good Men or Two Good Women: Concepts of law and Justice in Susan Glaspell’s “A Jury of Her Peers.” Studies in Shirt Fiction 36 (1999): 291-97. Print. This entry was posted in Uncategorized and tagged female confinement, Gender, murder, Short Story, Susan Glaspell, Women Writers. Bookmark the permalink.